Stunner is a missile defence interceptor terminal. 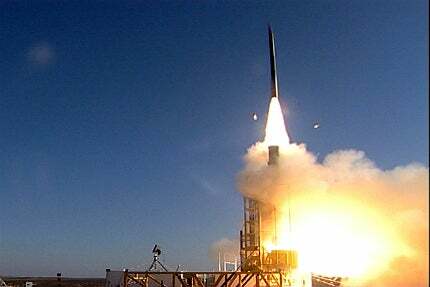 Image courtesy of US Missile Defense Agency, Department of Defense. A Stunner missile being launched during its inaugural flight test. Image courtesy of US Missile Defense Agency, Department of Defense. A Stunner interceptor destroying the target during the test. Image courtesy of US Missile Defense Agency, Department of Defense. The missile firing unit (MFU) / launcher of the Stunner missile. Image courtesy of US Missile Defense Agency, Department of Defense. Stunner is a two-stage interceptor missile developed to intercept short-range ballistic missiles, large calibre rockets and cruise missiles and unmanned aircraft systems. The Stunner missile forms part of the David’s Sling Weapon System (DSWS) which is jointly developed by Rafael Advanced Defense Systems and Raytheon Missile systems. The Stunner missile was successfully test fired for the first time in November 2012 and is anticipated to be operational along with the DSWS by 2014. "The Stunner missile was successfully test fired for the first time in November 2012." The DSWS is a joint programme between the Missile Defence Agency of the US and the Israel Missile Defense Organization to counter missiles and rockets launched by Hezbollah militants. It integrates powerful multimission radar, a battle management and control system, launcher and Stunner interceptor missile. Rafael, the main contractor of the programme, subcontracted Raytheon for the co-development of the Stunner interceptor and the missile component of DSWS. Raytheon is also responsible for the development and production of the missile firing unit (MFU), the launch system of the DSWS. Raytheon received two contracts worth $100m from Rafael for the DSWS programme, in October 2009. The company was also awarded a $30.2m contract in January 2012. The US and Israel entered into an agreement to continue the development of DSWS, in September 2010. The US Government is providing $149m for the DSWS programme in 2013 as part of $479.73m joint US-Israeli missile defence programmes. The Missile Defense Agency is requesting $32.5m for the programme for 2014. Stunner is designed to intercept short range missiles, theatre ballistic missiles, cruise missiles and large-calibre rockets with ranges between 40km and 300km. The missile uses direct hit-to-kill technology to destroy the target. Interceptor with war-head is also being evaluated as an alternative. The Stunner integrates into the David’s Sling missile defence system of Israel, bridging the gap between Iron Dome, which gives protection in range of 4km to 7km, and Arrow 2 shielding long range ballistic missiles. The Stunner acquires information from onboard sensors and off-board sensors such as radars of national airspace control, to get a missile warning. The Battle Management and Control (BMC) feature of the system maintains data from all the sources. The missile works with existing sensors, missile launchers and the Battle Management Systems (BMS). Stunner can be incorporated into integrated air defence missile systems. It can be used under many scenarios as it is can work with several ground, naval and aerial platforms. This ability makes Stunner a multimission and multiplatform interceptor. The Stunner can also be deployed from existing rail launchers and canister launchers. The Stunner can be fired at high rate as it requires less cueing from sensor resources. The missile features sophisticated steering control, multipulse propulsion and an advanced seeker in a light weight frame. Stunner’s multipulse propulsion and sharp steering increase its range and keep-out altitude to reduce the collateral damage from debris. The system can intercept targets in any weather conditions and counter measures as the seeker uses both electro-optical (EO) and radio frequency sensors. The two-stage Stunner missile is equipped with multipulse rocket motor. The first two motor pulses drive the missile in its mid-course flight. The third pulse is activated once the intercept course is determined, to increase the speed to maximise the interception impact. The missile can change the path and retarget automatically or by command. The missile is controlled completely by aerodynamics. It features two sets of four movable wings controlled by motor which is controlled by guidance electronic unit in the front section. The third set of wings is fixed, and acts as aft wings. "Stunner is designed to intercept short range missiles, theatre ballistic missiles, cruise missiles and large-calibre rockets." The missile first travels in designated path. The sensor nose of the missile finds the target and takes the final path and strikes the target. The Stunner uses radar and electro-optical sensors for guidance. The sensors are mounted on the unique dolphin shaped nose tip of the missile. The EO sensor acquires the target information during day and the IR sensor locates target in low light conditions. The Multi Mission Radar (MMR) of the system identifies the launch of the target rocket or missile. The radar is developed by Elta Systems, while its command and control system is supplied by Elbit Systems. The Battle Management and Control (BMC) system predicts the path of the target and calculates the interception point. Stunner uses a data link to communicate with ground station. The launch unit of DSWS system can hold 16 missiles at a time. It is equipped with short-burn droppable booster for high initial acceleration. The MFU of the DSWS allows the vertical launch of the missile for 360° coverage. The Achzarit heavy armoured personnel carrier was developed by NIMDA for the Israel Defence Forces.